Beachside Townhome, beach resort home in Panama City Beach. ***Welcome to “Beachside Bliss”, our beautiful gulf front townhome directly on the sugar-white sands of Panama City Beach! Beachside Bliss is a NON-SMOKING unit. Beachside Bliss is a 2-story townhome. It is *not* a condo in a high-rise complex. You'll have a private deck that opens directly onto the beach (you literally just walk out the sliding glass door). You won't have to park in some huge concrete parking garage (you park right outside the front door), you won't have to wait endlessly for very busy elevators, and you won't have to share the beach with the thousands of other condo residents typical in a high rise community. This truly is 'bliss'! The unit has 3 large bedrooms, all well appointed with quality furniture (and high-quality mattresses) so you can sleep comfortably after an adventurous day on the gulf. The master bedroom features a king size bed and picture windows that overlook the Gulf of Mexico. The second bedroom is kid friendly and can comfortably sleep 4 to 6 (2 queen beds and “full size” bunk beds). We also have a main level bedroom with a queen size bed adjacent to a (newly remodeled) bathroom with a shower. All three bedrooms have flat screen TVs (with an HD set in the master bedroom). The living room is well appointed too, and boasts a roomy sofa, a comfortable chair, and a 42' Sony Bravia HDTV (with a DVD player) for your enjoyment. The kitchen is a gourmet's delight... with custom Thomasville cabinetry, granite counters, an oversized center island, and high end stainless steel appliances. You’ll find the kitchen well stocked with dishes, pots and pans, and cooking/dining utensils. If you like to barbeque, you’ll find a nice gas grill ready for use on the gulf front deck. 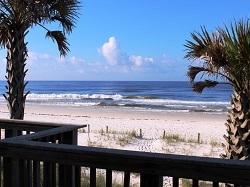 *** Beachside Townhome Rental in Panama City Beach FL.